Snack bars or crack? The world will never know. Kidding. You’ll absolutely love these gluten-free vegan raspberry crumble bars filled with homemade raspberry chia seed jam. In a large bowl, mix together almond meal, coconut flour, coconut flakes, cinnamon, and baking powder. Stir in melted coconut oil, almond milk, vanilla extract, and maple syrup. Set 1 cup of mixture aside for the top crumble. Place parchment paper in the bottom of a 9×9 baking pan, and then press the remaining mix into the bottom. Add raspberries, chia seeds, maple syrup, and collagen peptides to a pan over medium heat. Cook until liquid consistency, then let it cool down. Remove the backing pan from the oven, placing the raspberry jam filling on top of the bottom layer. Mix the reserved 1 cup from the bottom layer with the oats, and sprinkle on top of the raspberry jam layer. 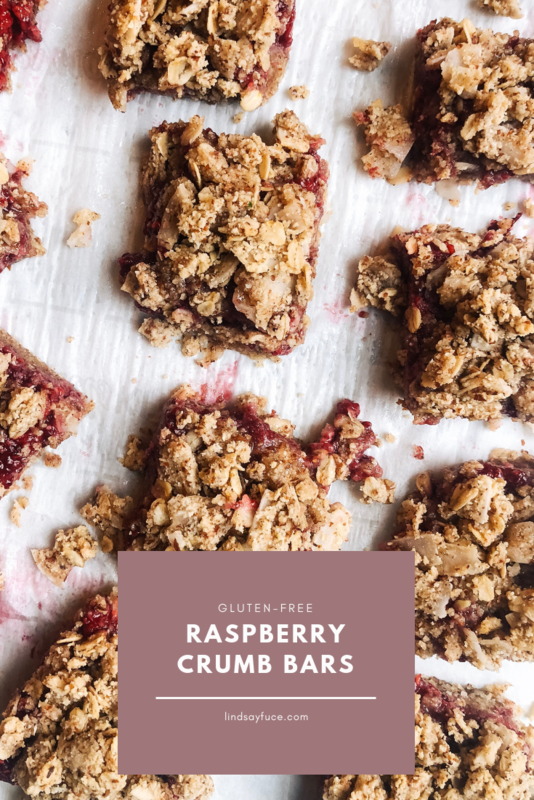 These new gluten-free raspberry crumble bars were made in the spur of a moment, but are now my new favorite snack. Anyone who knows me knows I am obsessed with raspberries. I could have them at breakfast lunch and dinner and still love them wholeheartedly. The other day I was trying to come up with some raspberry and strawberry themed desserts in honor of Valentines Day when I decided I would just start baking. I threw together my easy peasy raspberry jam and started on a base. That’s when I decided I would be making these gluten-free raspberry crumble bars. They might seem daunting to make at first, but they are really easy to make, it just takes a bit of time and layers. P.S. While you’re at it, check out my latest career oriented post “8 Easy Habits To Implement That Will Change Your Life.” As someone who hasn’t always been a huge advocate of good habits and steady routines, I’ve seen these things help me out in real time!